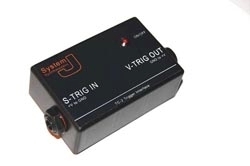 Converts an S-trig signal to a positive going gate or trigger suitable for Roland, Arp, Sequential Circuits, Oberheim and most other gear. ABS plastic case, non-slip rubber feet, 6.35mm jacks, 2.1mm DC socket, LED power indicator. Requires a DC power supply in the range of 9v to 12v negative tip - NOT SUPPLIED. Status: Built to order, dispatched within 3-5 days. I can supply a 9v DC power supply (EU plug only) for an additional fee if you can’t source one locally - contact me if required. Bought TC2 to trigger my sh101 with Korg stuff. Works perfectly. I don't know electronics so thanks for making these available!